Tag line: "The Most Unusual Story Ever Told!" After being trapped in an underground mine for several days, Ralph Burton (Harry Belafonte) emerges to find he is entirely alone. Even the normally crowded streets of New York City are vacant, and it’s not until Ralph visits a local radio station that he learns what’s happened; playing a tape still loaded onto a machine, he hears a news report about a radioactive attack that slowly encompassed the globe, killing everyone in its path. It’s at this point Ralph realizes he may never see another living soul again. It's weeks later, in fact, before he finally meets Sarah Crandall (Inger Stevens), a fellow survivor. The two quickly strike up a friendship that, before long, develops into something more substantial. Yet while Sarah seems ready for a relationship, Ralph believes his African American heritage is an obstacle they cannot overcome (Sarah is Caucasian). Things between them reach a breaking point when a third survivor, Benson Thacker (Mel Ferrer), arrives on the scene. Over time, Benson falls in love with Sarah, but she refuses to commit due to her feelings for Ralph, and even though they may very well be the last two men on earth, Ralph and Benson know a showdown is coming, and only one of them will make it out alive. It’s a fascinating story, and The World, The Flesh and the Devil sets it up wonderfully with some early scenes of Ralph making his way through a deserted New York City, searching frantically for signs of life. It doesn’t take long for him to discover all is not right in the world; hundreds of cars, seemingly abandoned, sit in front of the Lincoln Tunnel, while, in Manhattan, the streets are empty. Belafonte does a fine job conveying first the fear, then the frustration of being all alone (finding a handgun, he fires it into the air numerous times, hoping to get somebody’s attention). Yet as good as his performance is early on, it’s the scene set inside the radio station where Belafonte truly shines (while listening to the tape, a look of desperation crosses his face as a single tear runs down his cheek), and its thanks to him that the first half hour of the movie, which features the actor almost exclusively, are among the most poignant in the entire film. 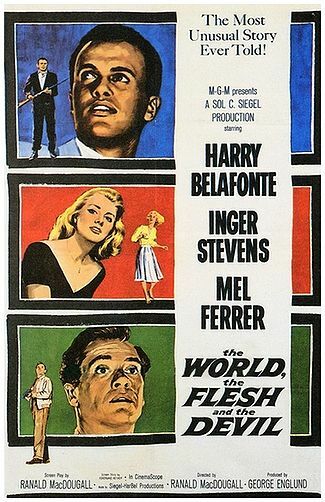 To coincide with its tale of survival, The World, The Flesh and the Devil explores issues that were prevalent in the late ‘50s, including race relations and social mores (when asked by Sarah why he’s avoiding a romantic relationship, Ralph answers, only somewhat tongue-in-cheek, that “people would talk” if he, a black man, started dating a white woman). The issue is further complicated when Benson turns up, mostly because Ralph, who was able to suppress his feelings while he and Sarah were alone, now must deal with the very real possibility that he will lose her forever. 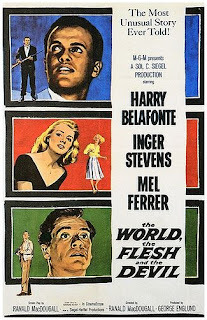 With its post-apocalyptic setting (much of the movie was shot in early morning, when New York was still sleeping) and tale of mass destruction, The World, The Flesh and The Devil is an engrossing science fiction film, and like all good sci-fi, it teaches us something about ourselves in the process.